My Halloween treat bowl is full; it's been pretty quiet. I've usually had about 50 young ones by this time of day and so far I've had one. I took the time to get out for a walk earlier. 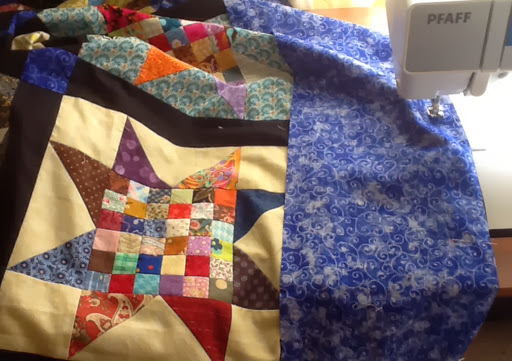 Despite the satisfying finish of my quilt top earlier in the week, this second half has been a little frustrating. 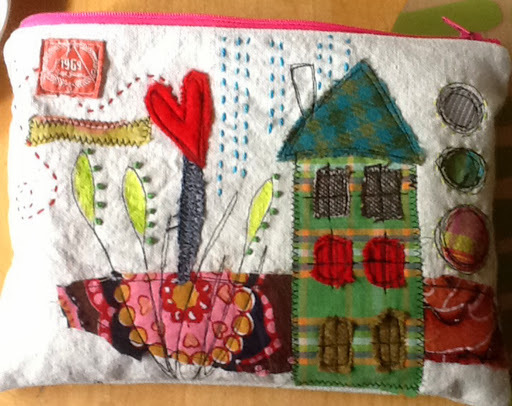 I was anxious to get back to my fiber art Fantasy Garden piece to try out some free motion stitching with my new machine. I tested it when I bought it but with regular cotton thread. When I switched to my specialty threads such as a metallic or the heavier Superior thread, it wouldn't work at all. I don't mean acting up a bit either. The needle wouldn't even pick up the bobbin thread. After exhausting every conceivable problem, I switched to a finer rayon thread, which I got working although it would sometimes skip and break. I'm hoping to talk to a Pfafff rep tomorrow before I take it back in to the dealer where I bought it. Today, I got out my old basic Pfaff, threaded it and got to work. Admittedly the rayon and polyester threads threads can be tricky, but I use them regularly with my older machines. 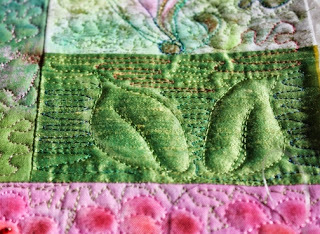 I'm pretty happy with some parts of this piece, especially the white raised areas that have become quite raised with the heavy quilting around them. 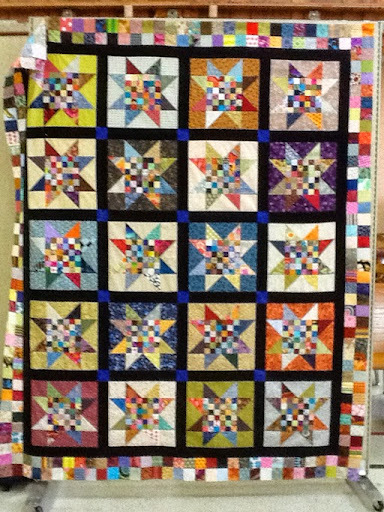 got most of the quilting done except for a few small areas. One area I'm not really happy with is the moon. I'm feeling as though I'd like to pick out the rings but I think the needle holes would show. 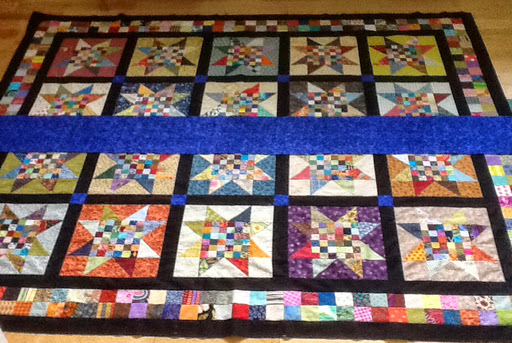 Perhaps with some final quilting and some added beading it will be better. I'll look with a fresh eye tomorrow.
. Since tomorrow I'll be out most of the day and Saturday is a guild UFO day where I'll be working on Christmas gifts, I likely won't get back to it for a couple of days. Hopefully, with the warmer weather predicted for the weekend, we'll get a little more yard work done. 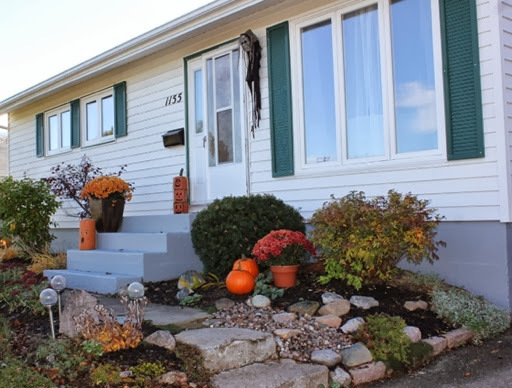 It's time to put away the concrete birdbath, get out the heated one for the deck rail, tie up some trees and maybe do a bit of raking. I was out today for a doctor's appointment and then coffee, so I didn't spend my usual time in my studio. However, I had just enough time to get the last border on the postage stamp. The top is officially finished! I've measured it and will fold it up and leave it until the machine quilters are less busy after Christmas. I took a side view to show that the borders on the sides are wider than at the top and bottom which I did to make it the size that suited me. I'm so happy it's done. I will only start another quilt after Christmas to be taken to my guild UFO days . Having spent the last few months doing more traveling than Ive done in the last several years, I really feel the need for a breather. 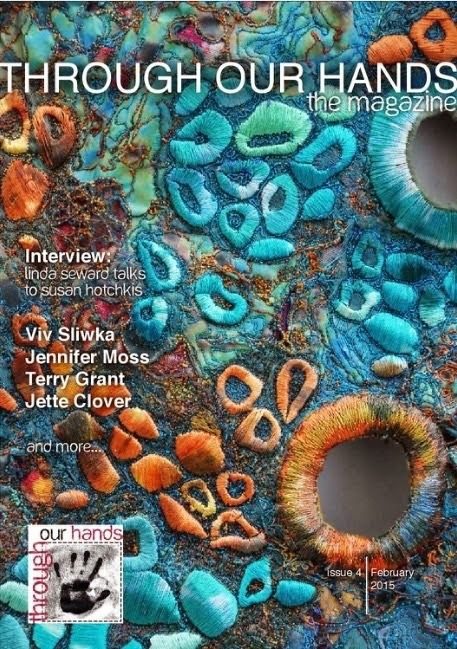 Add to that the fact that my interests are varied and range from traditional quilting to fiber art, knitting and cooking, Ive been feeling a wee bit scattered lately. Often too, I feel low upon waking in the morning due to low cortisol levels which are related to my Addison's disease. So this morning after chatting with my daughter via Skype about her marathon weekend, I got my housework done and headed out the door with walking poles and camera in hand. For an interesting and touching read about her first ever full marathon go tho her blog, Adventures In Korea. I'm so proud of her! She has overcome many adversities in her young life. 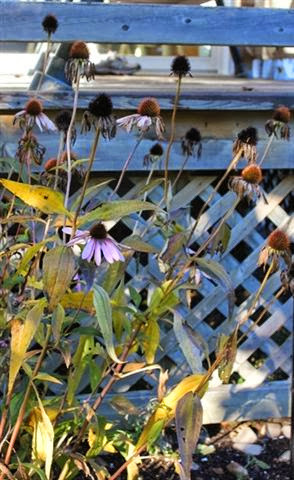 for the most part the brilliant hues have faded to more muted golds, greens, silvers, greys and beiges. Quite lovely in their own quiet way. 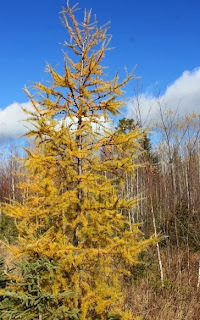 The odd tamarack punctuates the muted landscape with gold. 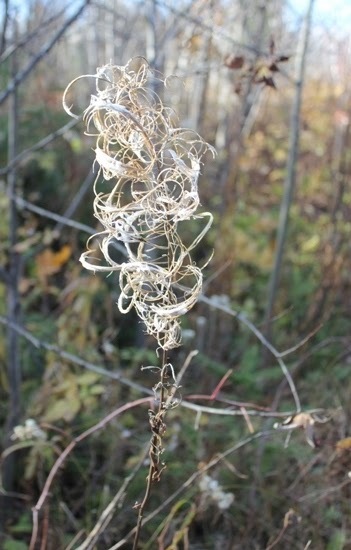 As always, there are several dried weeds and wildflowers that catch my eye, especially this spirally shaped one that I notice every year. It ay be Fireweed, not sure. 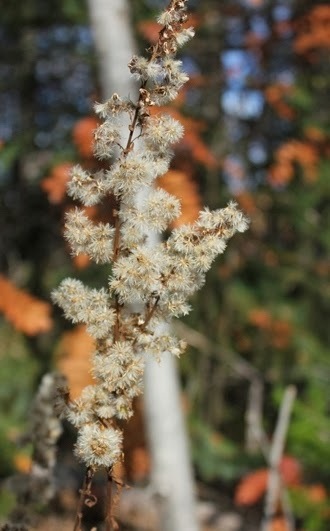 And this fluffy Pearly Everlasting that is going to seed. 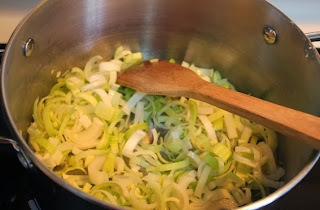 With a vastly refreshed body and mind, I quietly ate my lunch and then chopped leeks for a cream of broccoli soup. I added garlic, organic veggie broth, broccoli and some wild rice and brought it to a simmer. It is now turned off awaiting blending with a bit of milk, perhaps some grated cheddar cheese, to be served with organic 12 grain toast for supper. Definitely comfort food. And I'm definitely feeling calmer and happier. 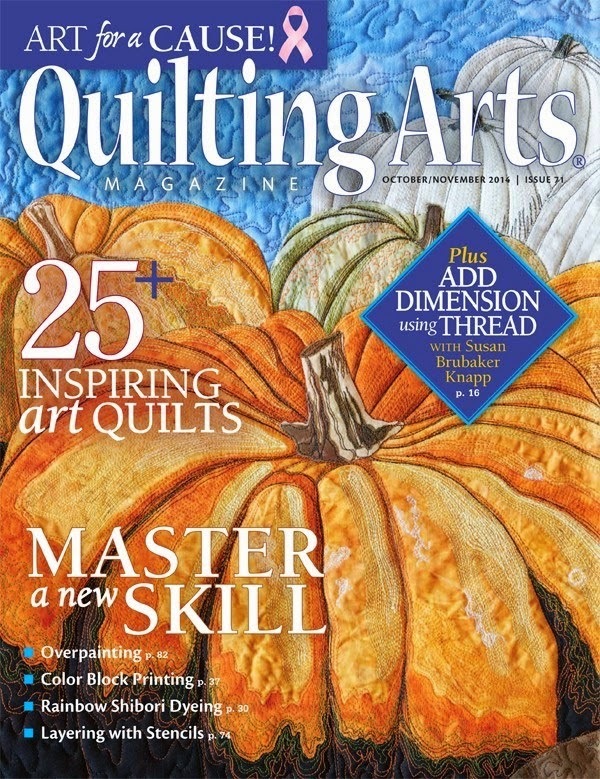 There seem to be so many things to do in the fall, it's hard to get to the sewing room. Today I visited the little market downtown where I picked up fresh cranberries, carrots and tomatoes. 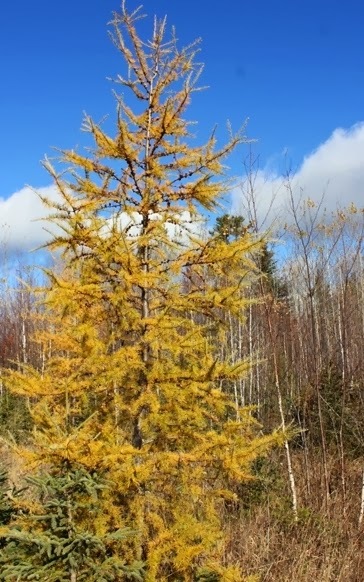 We are nearing the end of the season. It is getting pretty cold out, frost on the windshield in the morning cold. I must get the rest of my own carrots picked! Yesterday, my friend, Glenda, dropped off a bag of her grapes which I crushed, simmered and hung to drip in a cheesecloth bag all night. 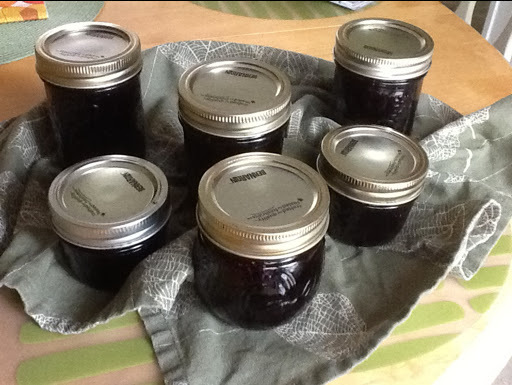 This morning, I cooked up a batch of grape jelly. Wow, it really shocks me how much sugar goes into to it! I even used the Certo light. I really must do some research into some with less sugar. 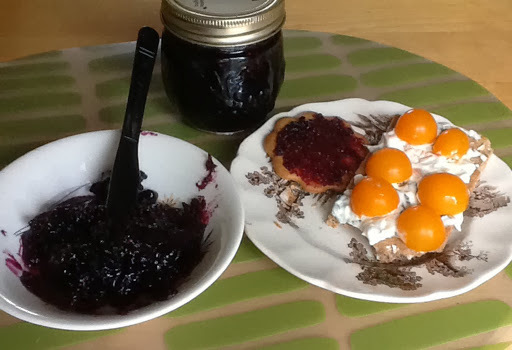 I don't often eat jam though, probably only once every couple of weeks and I will give a few for gifts. Of course I had to try a teeny bit on a ginger snap for my snack this afternoon. I know, a Ryvita with low fat dip and garden tomatoes is an odd combination to go with it. Produce is so tasty when it's local. I finally put my computer on in order to close the comments for my giveaway and I've chosen a winner for the Painsticks. Congratulations Verna! I'll need your mailing address. I've just got the two final top and bottom borders left on my postage stamp! So excited! Yesterday, I had time to kill after my tutoring before picking up my husband and in anticipation of this, I packed my camera and my little traveling sketchbook packet. My friend, Nicole makes these from canvas and recycled clothing bits. Isn't it wonderful? I stopped at one of my favourite vantage points to take pictures and do a quick sketch. 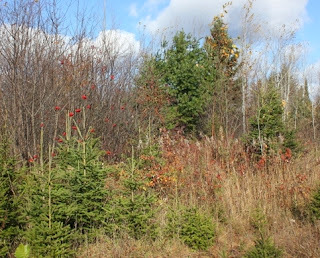 I love the gold and silvery colors of the foreground foliage. Before leaving home, I took a picture of the front of my house. It's a small but cozy abode. And I am as enthralled with dried flowers as I am with the bright summer version. They are softer in color and wonderfully graphic. 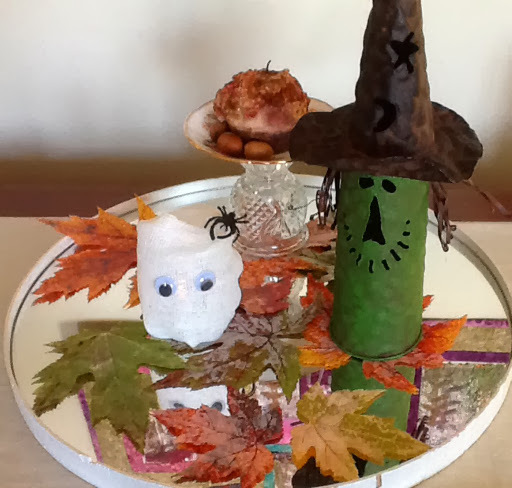 Inspired by some little ghosties that my son's fiancé made using gauze and jelly jars, I made one for my table arrangement. It has a little battery operated flickering candle in it. Google it if you like. There are lots of versions and directions on line. I think it needs a black felt mouth; I must go looking for a scrap. 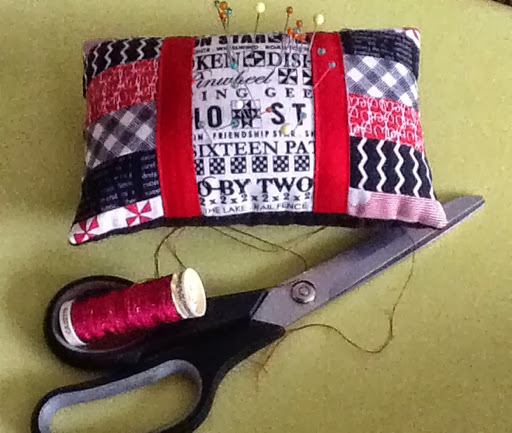 This morning, I did a little sewing on a Christmas project. It's the time of year when I can't always post about what I'm doing! 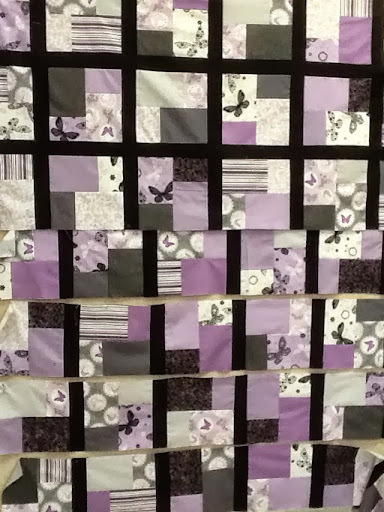 I also got the last black border on my quilt and laid it out to cut the final fabric border. I've pinned the first one on and laid it out for later. 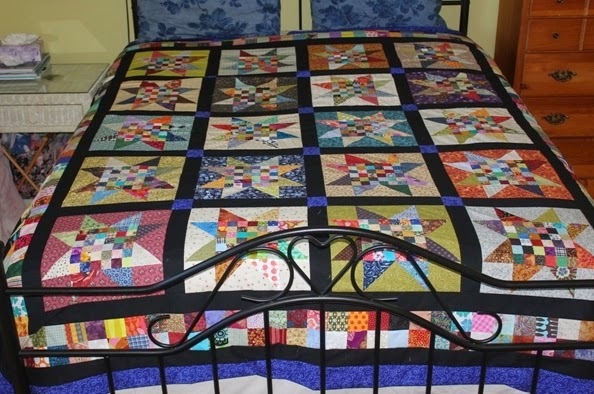 This quilt has been a few years in the making; it's so close now that I want to finish it. 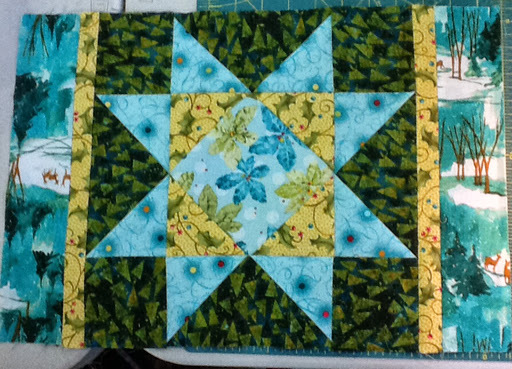 I had thought I might send it out for quilting before Christmas but it does seem that many of the machine quilters are rather busy with Christmas quilts. 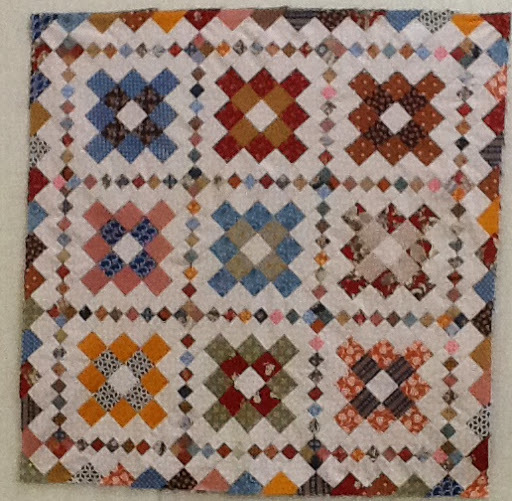 I'll finish the top, gather the batting and the backing and fold it up until after Christmas I think. For my quick sketch I took a few artistic liberties when I found my paint brush was nearly empty of water. I wasn't able to mix the softer colors, so I went with the colors that would have been there a couple of weeks ago. I forgot to add the photo earlier in my post and I can't get this Blogger + on my I Pad to insert in the middle. Oh, and yes, the horizon line is tilted. It's hard to get things straight when your drawing against the steering wheel of the car! I'm in cleaning and sorting mode this week meaning I've not progressed on the following art piece. 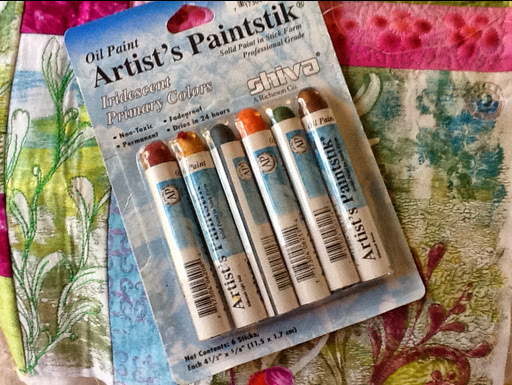 One of my friends who has been doing the same thing, delivered a goody bag of assorted tulle, silks, fabric paint and these Shiva Paintsticks to me yesterday. 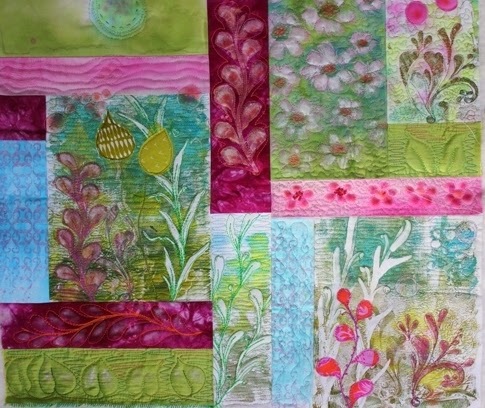 In the detail of my garden piece above, you'll see an example of Paintsticks on the pink flowers. I use them a lot in my work for accenting. You'll find lots about them on line. 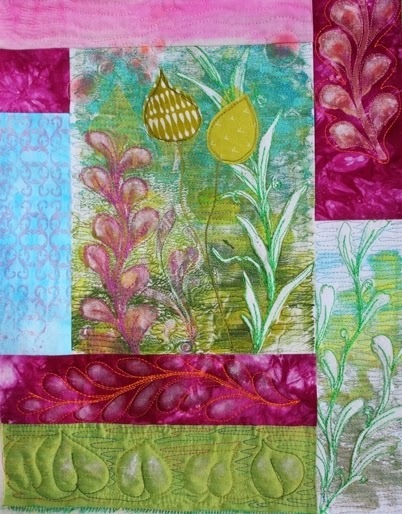 They can be used with stencils and are heat settable on fabric. Since I already have a package, I'm willing to share this one. It's been opened but barely used. If you leave a comment to let me know you'd like to have them, I'll pick a commenter and send them on. 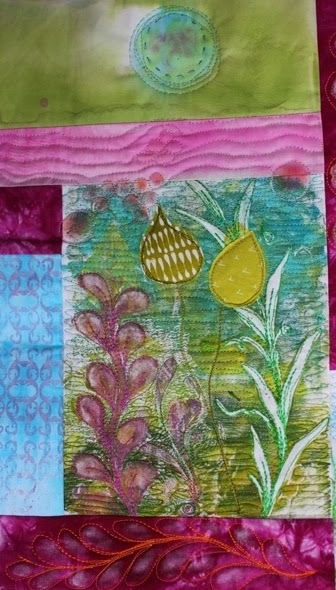 I'm stopping by for a few lines to say I'm here although I did no fiber artwork today. Yesterday, I had plans for sewing and baking; however, I woke up with a raging bladder infection. It was the first one I've had in years, but no mistaking it. Luckily, I got into the clinic without much of a wait where the doctor wrote me a prescription. I started drinking cranberry juice with water added before I even picked up my prescription and the pain was significantly lessened almost immediately. So, then I kept sipping it all day. I laid low for most of yesterday, mostly reading and knitting. Today, I've been cleaning and doing some little odd sewing jobs that have been on my list. I thought you might like to see this sweet pin cushion that I received from a friend for my birthday. She brought it to retreat on the weekend. It is firmly stuffed with ground walnut shells. Well, I'm here in my little room, stretched out taking a small break before dinner. I'm at one of our annual guild retreats. 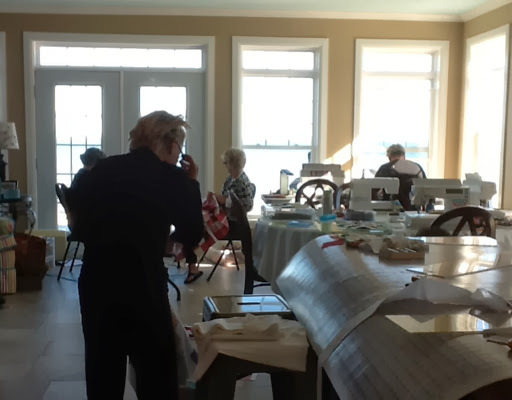 It is so fun to have nothing else to do but sew, and chat and laugh, no cooking, no cleaning! 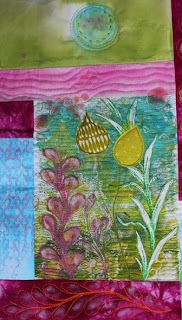 I don't bring any art quilting as I'd never be able to pack it all, so I concentrate on a quilt or a few Xmas gifts. The rage this year is these fun and simple placemats. 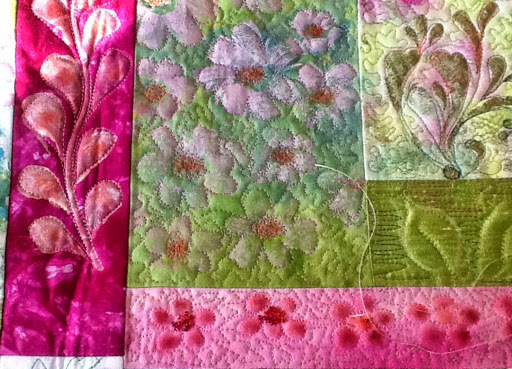 I'm doing some placemats too, but as I watched these going together, I've been lamenting my more complicated choice. It took me all day and some of last night to get mine together (pictured further down) and I've still got to quilt and bind them! 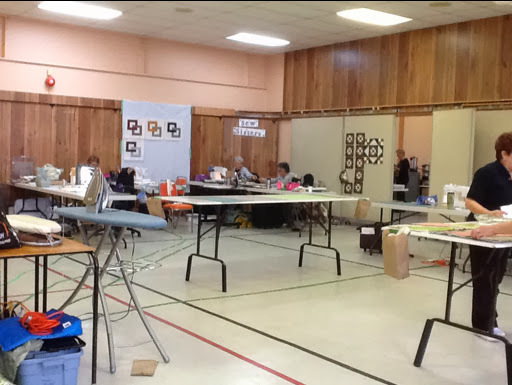 There are 26 quilters this retreat as opposed to just over 40 who are signed up for February. It is a nice cozy number with lots of space. As the weekend progresses, the walls get fuller. The placemats spread through like wildfire. They were done using four colors stacked and cut, and then shuffled. 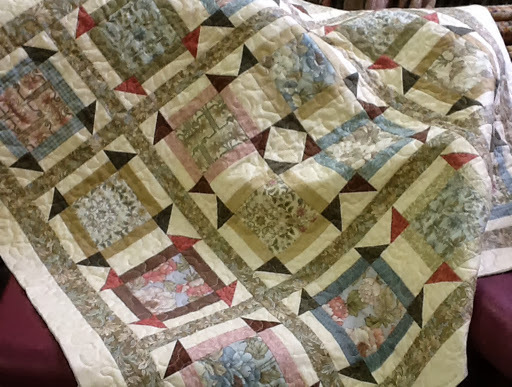 This Schnibbles quilt called Clover was done from start to finish by my friend Sue. There are 773 pieces in it! It's fun to take a break to walk around and see what everyone is doing. There is always such variety. I love the modern feel of the next one. 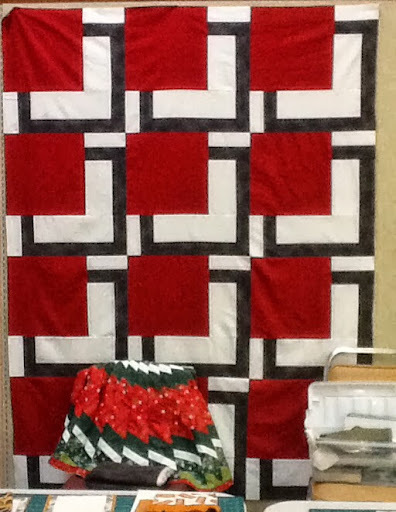 And do you see that amazing tree skirt folded over the chair? 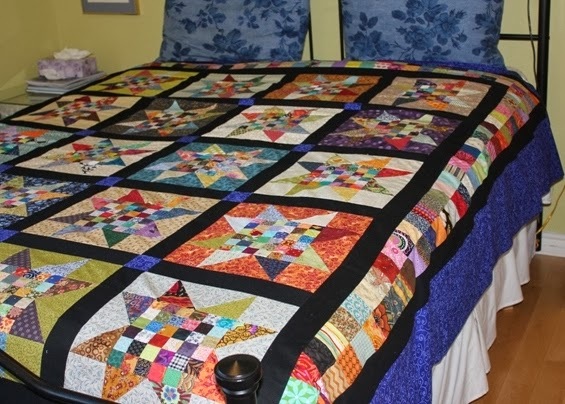 I'm sewing the outside black borders on my quilt right now. 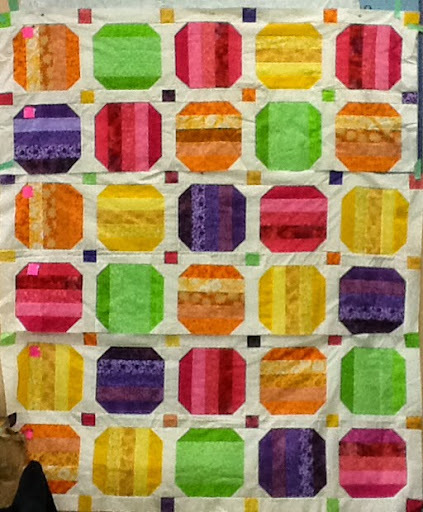 I got the square patch borders all sewn on. Yesterday, I spent spent the whole day sewing 4 Christmas placemats. 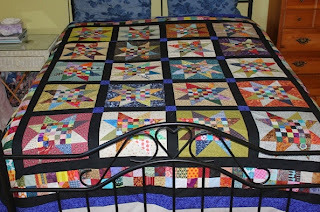 I'll save the quilting for home. 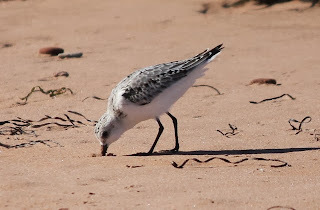 I started writing this post last night, but I'm just finishing it now. We've got only a couple of hours left. I'm really going to need a rest tomorrow, but it will have been worth it! What a wonderful way to spend a weekend with friends. We've had a few people who have travelled from other guilds and one from another province. It's a nice way to develop new friendships and to get closer to those you know. 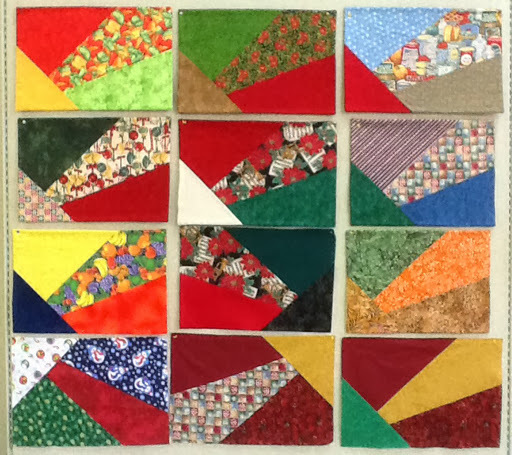 Here's one final colourful quilt that just went up on the wall. I love it! I've just got a couple of quick photos to show since I'm in the midst of packing for our guild retreat which starts tomorrow morning and ends Sunday. Phew, it's been a busy fall. This is it though, until Christmas, I hope! 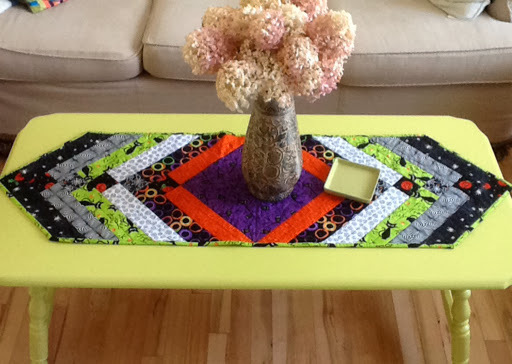 I got the binding stitched down and laid out my Halloween table runner this week. 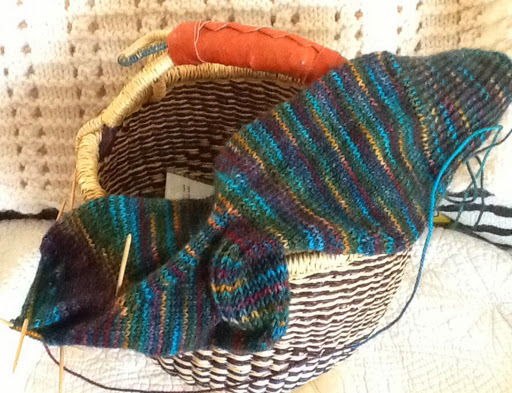 And, I've been working on theses socks from a hand dyed yarn while I was in the car in my travels. 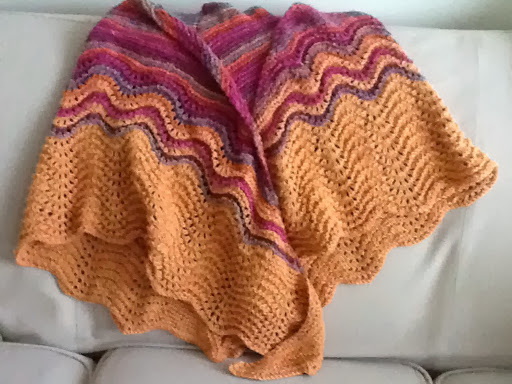 Also, yesterday, I pulled this unfinished shawl from my closet this week, got it back on the needles (I had gone to far), got it cast off and ends sewn in. Woo hoo! I've been feeling the need to get some projects finished and things cleared out as we head into the Christmas season. Does that happen to you? I cleared out a bunch of recyclables and next week I plan to make a donation to a local second hand store. 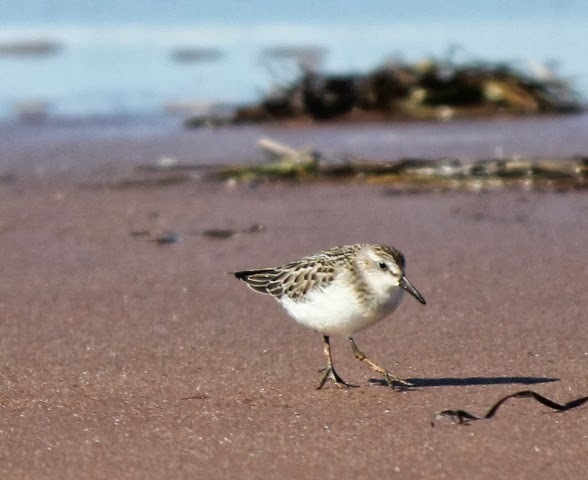 Once again, we were lucky to have the perfect weather for our Thanksgiving weekend in PEI. 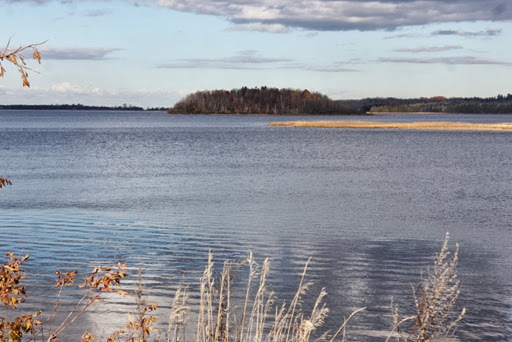 It was a bit windy and cold on the first day making for a brisk beach walk, but the following days warmed up considerably. We visited the beach several times over the 3 days. The clean air, sparkling waters and the gentle crashing of the waves were balm for the soul. 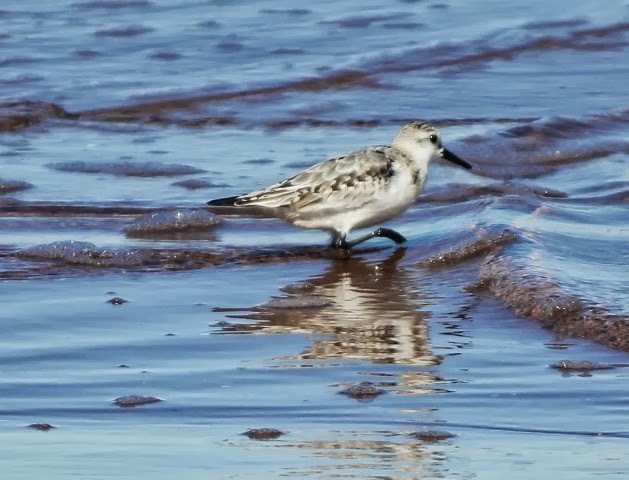 Also, I was quite surprised to find that the plovers and the sandpipers were still there. The plovers especially run around like little motor boats gone amok and it's quite a challenge to catch them on camera! 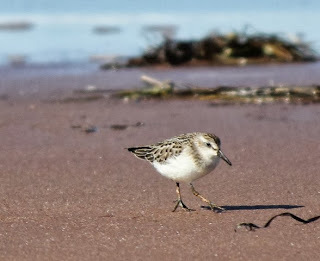 We were able to get up to Charlottetown to shop, to see my mom's new apartment and to have dinner with her and her husband. They will leave in two weeks for Florida, so it was nice to her before they go for the winter. Sunday, we had a lovely potluck turkey dinner at the cottage. The food was wonderful! Boy my brother does a special turkey and the best gravy ever. My husband is vegetarian; I call myself a 'flexitarian', so I opted for some turkey. My brother made a special dish for my husband. We got to see some family that we missed during our summer visit too. This morning, Gord flew to Labrador City for work, so I'm on my own for a few days. I met friends for coffee this morning and did some errands.This afternoon, I sat down with my Fantasy Garden piece to do a little more free motion work.My new machine and I are still getting acquainted, meaning that I'm working even more slowly than usual! 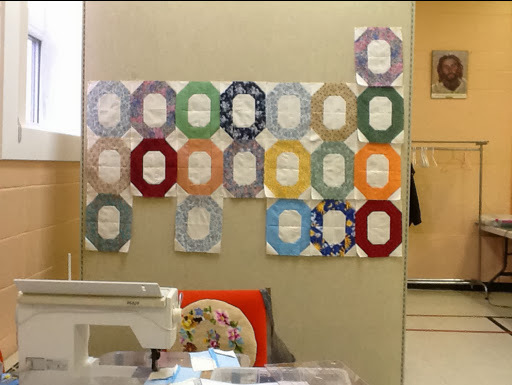 I have to think about how I want to quilt each section, audition some threads and try a sample before I actually get down to it. 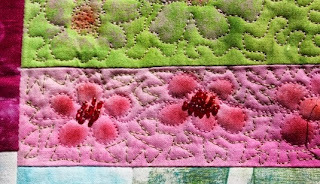 I made a decision, finally, and free motion zigzagged this little section around the flowers where I'm now stitching the beaded centers. 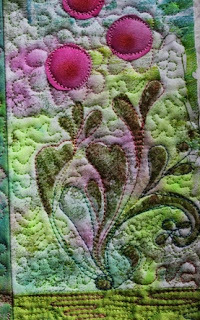 Then I free motioned some leaves on a small section of silk and added some variegated silk thread quilting to make them pop. 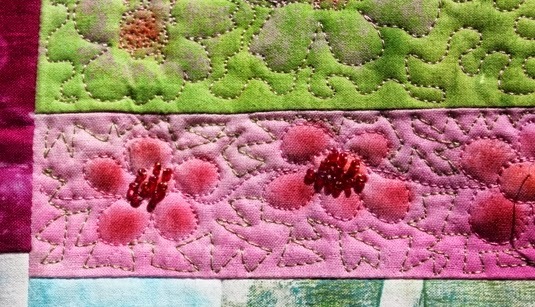 Next, I used the same variegated thread to outline a floral section. I did a small stipple in the background. Each day I'll continue to do little sections as I work my way around the hanging. The area above measures about 4" by 7" and the whole hanging is about 20" by 21 1/2". I'm as lazy as all get out this morning! Have you ever heard that expression? My grandmother used to say it and it just came to me. Gord and I got our flu shots last night. He had no side effects but by bed time I couldn't move my arm. I slept restlessly and kept having a repeating nightmare after about 3am. Anyway, it's an at home day today, and I'm doing wash and getting packed for our Thanksgiving trip to PEI tomorrow. 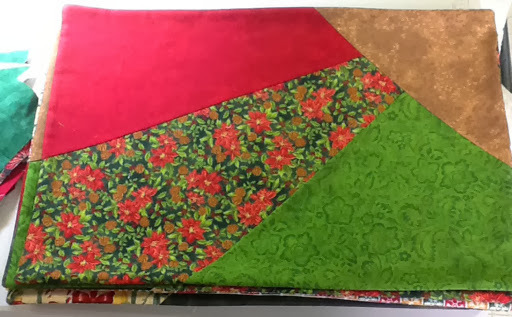 In the next week, my goals are to first cut up fabric in preparation for the guild retreat next weekend, and only after that will I do any work on my art quilts. 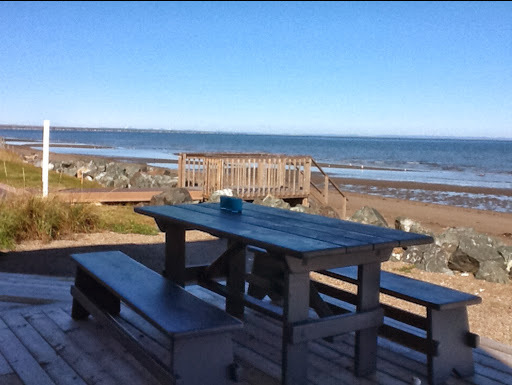 Yesterday, when I went down to the cottage for lunch after my swim, I took a couple of photos. Here are some of the ladies at work. It gives you a bit of an idea of just how we can take over a space; it was a-buzz like a busy little bee hive. Unseen around the corner, one lady was sitting at a floor hoop doing some hand quilting. The space is all windows and what a view! 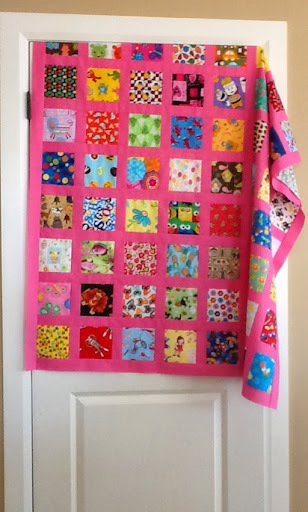 I didn't take photos of all the projects but I took this one of the very pink eye spy quilt being made for a lucky grand daughter. 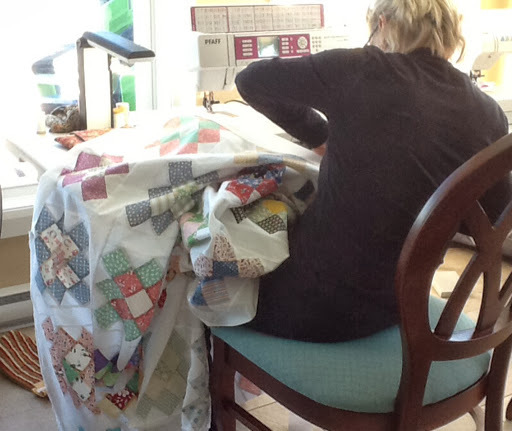 And I couldn't resist this shot of my friend putting the final borders on her repro granny square quilt. We're having another beautiful fall day, so I shall need to get out and enjoy some of it. I hope you can too!